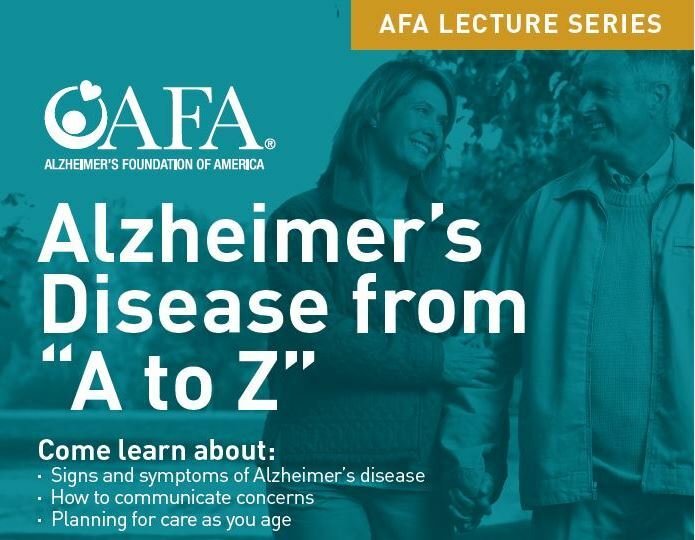 AFA’s “Alzheimer’s Disease from A to Z” educational program is designed to help individuals be proactive about their brain health and get information that can help them, regardless if they’re currently affected by Alzheimer’s disease. Each event provides information about the signs and symptoms of Alzheimer’s disease, teaches participants how they can communicate concerns and offers practical tips about preparing a road map for care. Free, confidential memory screenings are also offered. Continuing education for licensed social workers is also available free of charge. Click on the program dates for information about program locations and to register. This program is approved by the National Association of Social Workers (Approval # 886446769-4489) for 2 continuing education contact hours.